This entry was posted on Tuesday, December 4th, 2018 at 9:14 am and is filed under 2016 Election, 2020 Elections, Politics. You can leave a response, or trackback from your own site. 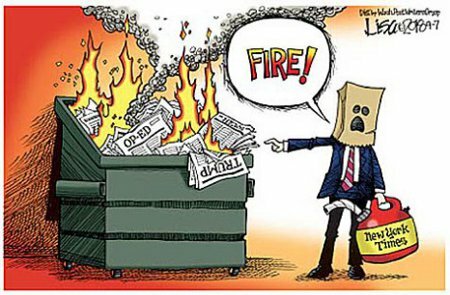 Sadly and maddeningly, the truth today is that, when it comes to Republicans in general and President Trump in specific, where’s there’s smoke there’s a Lamestream Enemedia partisan committing arson. The “Press” has largely gone from reporting the news to manufacturing Fake News meant to destroy our nation’s people and the elected leaders we’ve chosen for ourselves. This entry was posted on Saturday, September 22nd, 2018 at 6:44 am and is filed under 2016 Election, 2018 Elections, Politics. You can leave a response, or trackback from your own site. 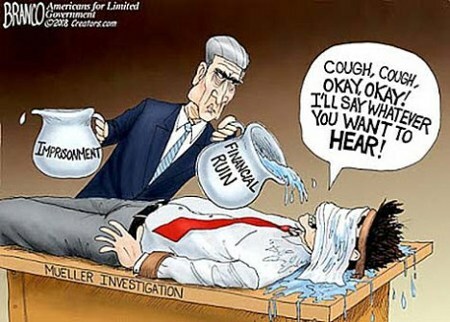 Yes, Mueller’s ever ongoing witch hunt against President Trump, his family, and any and all associated with Americans’ president has managed to find a couple of “witches,” Michael Cohen and Paul Manafort. 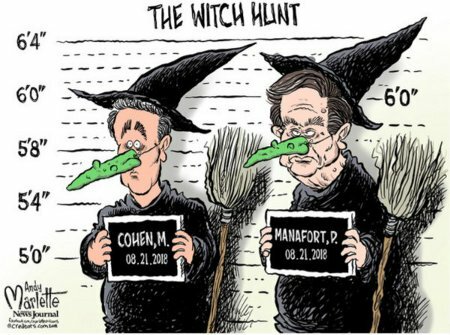 Of course, like so many other witch hunts throughout history, Cohen and Manafort are only witches because the crowd, in this case the Lamestream Media, claims that they are such. There is still no evidence, or even any real suggestion, that there was any “collusion” between Trump and “The Russians” to affect the outcome of the 2016 elections. None! Nor will there ever be any real evidence of that because this witch hunt is born of hatred for the President, delusions of his vanquished opponent, and certain sort’s strongly held belief that Trump was not supposed to win. 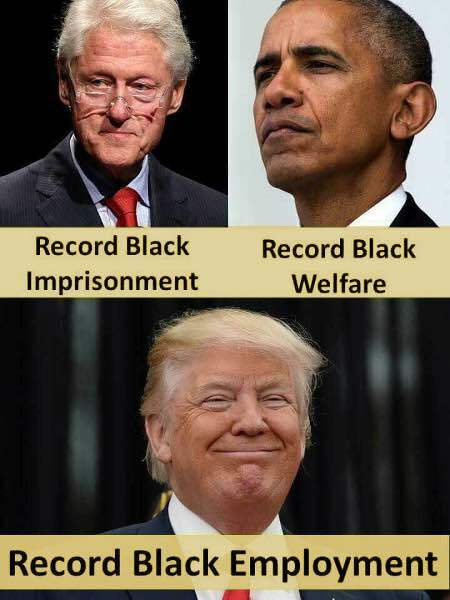 This entry was posted on Sunday, September 2nd, 2018 at 7:52 am and is filed under Politics. You can leave a response, or trackback from your own site. According to New Your Times reporter, Amy Chozick in her book, Chasing Hillary: Ten Years, Two Presidential Campaigns, and One Intact Glass Ceiling, these were some of the words said when Hillary was told by her campaign manager, Robby Mook that she had lost the 2016 election to Donald Trump. Normally I’d ignore reports of any sort of bitter, paranoid, entitlement-driven, delusional rantings from Hillary. It’s not normally worth the effort to comment upon such things because Hillary herself isn’t worth commenting much upon now that she’s no longer a threat to Americans’ nation thanks to the grace of her and her supporters’ betters. 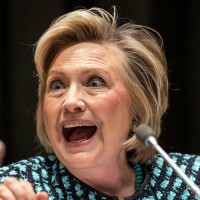 But, while Hillary’s behavior as reported by Chozick is extremely abnormal for Americans, it is perfectly normal for Hillary and Hillary’s supporters. Hence, I felt the need to comment upon it. This bitter anger directed at some nebulous “They” or “Them” that “wouldn’t allow” them to get their way and, hence, “persecuted” them is the very foundation of Hillary’s, the Democrats, and the entirety of the modern Left’s psyche. It is also the cornerstone of the collective psyche of those demographics that they pander to- and enable. That’s something that needs to be commented upon, even if only as a reminder to Americans as to the nature of the enemy we fight against. This entry was posted on Tuesday, May 8th, 2018 at 1:24 pm and is filed under 2016 Election, Politics. You can leave a response, or trackback from your own site.